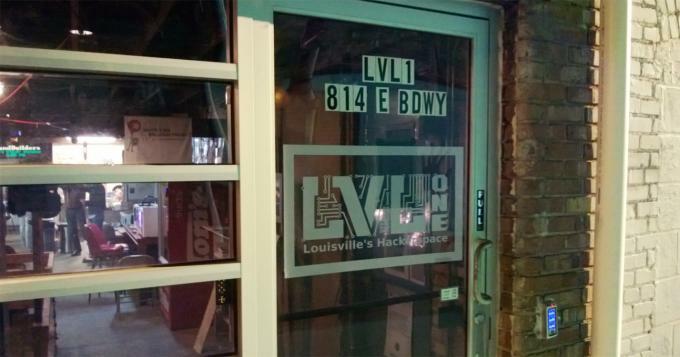 On April 2, 25+ local designers and entrepreneurs met at LVL1 Hackerspace. LVL1 consistently draws a diverse crowd of designers, artists, scientists and engineers, from the technically savvy to those who are just learning the basics of computers. It’s truly an eclectic space, open for anyone to discuss new ideas and experiment with projects. Our group mingled over pizza and drinks before hearing excellent presentations from LVL1 members and touring the facility. First to present was the founder and president, Chris Cprek. He is an advocate for maker education, and actively promotes this hands-on learning in the community, including local schools and the Girl Scouts. We learned that hackerspaces are popping up more and more around the world. The Metalab (https://metalab.at/wiki/Info_Folder) in Vienna was one of the first hackerspaces. LVL1 was started in 2009 with 20 members and moved into its current space in 2010. They have since grown to 60 paid members with an additional 60 regular visitors. The group is a nonprofit open community lab and workshop, democratically operated by its membership. They provide free resources to the community, including 3D printers, CNC routers, electronic soldering equipment, and various wood & metal working tools. They are quickly outgrowing their space and are looking to move into a new space that will allow them to scale up. Galen Powers, longtime LVL1 member and local entrepreneur, shared a photo stream of some of the more unusual member projects. The group often hosts fun maker challenges. Some of the past challenges include marshmallow Peep torture devices, a mind controlled exploding melon device, a fire breathing horse, and tricked out PowerWheels with regenerative braking. Other community-focused projects have including reusing discarded bits of solar cells to make solar cell picture frames and sound builders events where teams build new innovative musical instruments. A student member of the LVL1 community, Nolan Park, currently studies at the University of Louisville’s J.P. Speed School of Engineering. His project, an electronic bike with regenerative breaks, is nearly complete. Nolan became interested in motorsports racing at an early age and decided that he wanted to become an engineer. His bike incorporates a motor from an old scooter, three car batteries, and a few clever hardware hacks. While braking, the battery regenerates itself, which is similar to technology used in Formula 1 racing and increasingly seen in consumer bikes and hybrid vehicles. He was also proud of another small hack: his headphone cords are sewn into the strings of his hoodie and its input is routed into his pocket. He doesn’t need to worry about misplacing or tangling his headphones now that they’re literally built-in. Kartik Kamat, a local entrepreneur whose family owns a granite countertop company, comes into LVL1 frequently to experiment and test his ideas. After prototyping, if he discovers that an idea is not viable, it “frees up brain space” and gives him the confidence to move onto his next big idea. Similarly, just by meeting and talking with specialists in various fields, he can weed out the bad ideas from the good, without breaking the bank on R&D. Kartik’s experience captures the true spirit and purpose of a hackerspace. LVL1 is open to the public for a weekly meeting on Tuesday evenings. The community is participating in the Detroit Maker Faire this coming July as well as a mini-Maker-Faire in Louisville this fall. It was interesting to discuss how members of our IDSA chapter could use the space and share our interests and skills with this community. We were inspired, and began to imagine the LVL1 of the future, where designers experiment alongside engineers and programmers, and where workshops and classes are taught, similar to TechShop and designer-friendly 3rdWard. We look forward to using this incredible space, sharing our ideas and supporting LVL1 as it continues to grow.